Most disability research involves people with disabilities as research subjects, not partners in the research itself. Washington State University researcher Davi Kallman hopes to change that. Perhaps it is inevitable that she is passionate about encouraging people with disabilities to pursue academic research on the subject. Completing her doctorate degree at WSU’s Edward R. Murrow College of Communications, she has a disability herself. 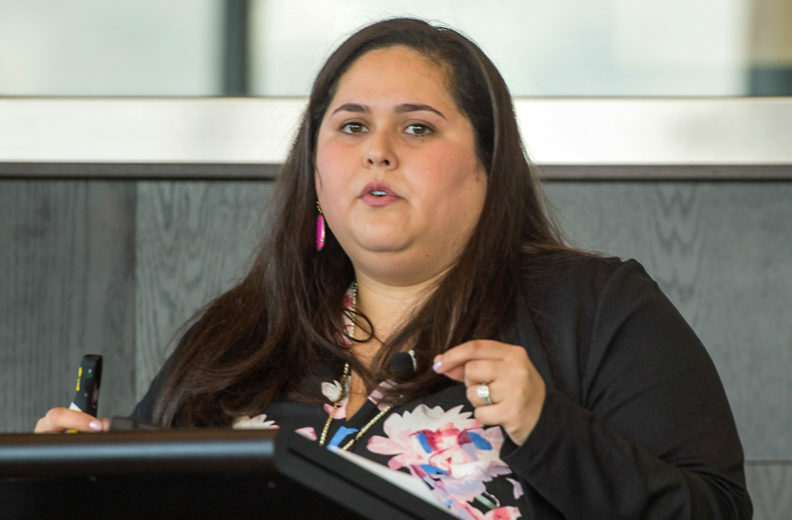 Kallman shared her perspective recently as keynote speaker at the WSU Access Center’s Disability Awareness symposium held on the Pullman campus. “Nationwide, there’s a lot of talk about bringing diversity to the table, but largely absent from that table are people with disabilities,” she said. The missing place is a paradox. As the nation’s largest minority group, the disability community is a cross section of American society, Kallman explained. What’s more, “It’s the only minority group that you can join at any time of your life due to illness, an accident or the process of aging,” she said. Kallman was diagnosed in second grade with severe dyslexia, a cluster of symptoms that can make it difficult to learn, read and interpret words and letters. “My teachers said I wasn’t smart enough to be in a general education class,” she recalled. She proved them wrong. With help from a devoted mother and specialized tutors, she learned to spell words phonetically, take meticulous notes and problem-solve in pictures. Today, she regards her dyslexia not as a learning disability, but a learning difference that gives her a distinctive perspective as a researcher. Whether formulating research questions or conducting interviews with people with disabilities, “researchers with disabilities bring a different level of knowledge and experience to the table,” she said. Additionally, the personal challenges of people with disabilities often spur them to solve problems and accomplish tasks in novel ways, she explained. It may not be an easy road, but academic scholars who face disability challenges can build successful and rewarding careers, she told the audience. Kallman researches the ways people with disabilities are portrayed in the media and attempts to reduce prejudices and negative stereotypes about them. At the podium and off, she is upfront about having dyslexia, disclosing it in her CV and even in her published research.